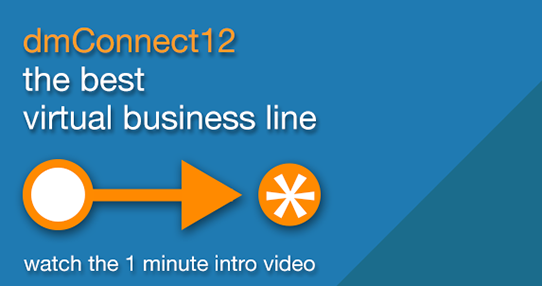 dmConnect12 is our simple call forwarding service, and works with VoIP and PSTN. With dmConnect12 you can choose an inbound number from any of our number ranges, and set one or more divert destinations using our online controls. When the number is dialled our network will divert the call to the chosen destination number. Inbound call costs are competitive, for both VOIP and PSTN destinations, whether routing to numbers in the Uk or abroard. Outbound calling can also be done economically. Click here for a full cost breakdown. dmSwitchboard12 is our flexible virtual switchboard, designed for small to medium sized organisations. It supports all the features you would expect from a modern switchboard, including up to 30 extensions, which can be allocated to receptions, teams or individuals. dmAnswers14 is a pay-as-you-go 'receptionist-like' human answering service, available to take calls 24 hours a day, 7 days-a-week. It's controllable through a smartphone app, allowing you to specify your availability to take different type of calls, and a message to give callers. Become a dealer. As well as selling our product portfolio directly, dmClub offers dealers an opportunity to resell our services under the dmClub Dealership Programme. Start offering all our products to your customers, and earn a generous commission on all sales. dmClub offers first-class product support. All customers have access to out online support desk and dedicated support site, as well as the option of picking up the phone and talking to one of our experts.